Chicken, necks and hearts, zucchini... There's no room for a cow in here. And then we have laying hens and cows now. We have rhubarb and asparagus planted and doing well. Our herbs are doing well - chives, mint, lavender, rosemary, oregano. We'll also be getting some beef bones and fat from our friends cow to make bone broth and tallow. As you can tell, unfortunately, many of the things I was hoping to grow never made it into the garden, or didn't make it once they were in the garden. That includes broccoli, cabbage (which was awesome last year), cauliflower and brussels sprouts that were destroyed by Basil (our cat). And a few other things. So here are my quick summaries. What are they good for and how did they grow? Grew well even though we didn't do much to maintain. I let them get really big and shredded them up for zucchini bread and zucchini cakes. They are easy to store in the freezer that way. From two trees on the property. We missed a bunch at the beginning because life was very busy this summer with Joel’s job. We didn’t go apple picking, but I’m so thankful that we could put up this much applesauce. I use applesauce as a treat for the kids, mixed in with homemade plain yogurt, and to save money on oil. I substitute applesauce for oil in some baked goods and our oatmeal and wheat pancakes. We planted three organic varieties that we found at the supermarket. They started to sprout on their own, so we put them in the ground. Two 9’ rows of yellow, one 9’ row of russet, and one 9’ row of red. The red didn’t come up, and although the yellow had good plants, we have very few potatoes. The Russets did amazing, so next year we will focus on russets. We started with a handful of quartered and sprouting potatoes and ended up with about 10lbs. Not bad for our first year and forgetting about them. These did great last year, and they did great again this year compared to the rest of the garden. There were more in the garden, but we planted late and a few weren’t quite big enough or we lost to chicken pecking. We loved spaghetti squash with a cheesy beef sauce over the top this year. In past years, we’ve put a red sauce over it. I also saved some seeds from these since they did so good. These did pretty good. I don’t have any complaints. We used them for pumpkin pies at church and pumpkin pancakes at home. Tomatoes These didn’t come from our garden. I found someone in Center Harbor who was selling them for $2/bag when they had a ton! So I brought home a couple bushels or more in weight. I could see his plants from the road and they were beautiful. So smart to grow so much of what you are good at and just sell the excess on the side of the road. They don’t use pesticides or herbicides. The grapes are from my dad's old grape vines on our side of the property. We were late with these too. I also missed the peaches when Joel was away. I wanted to can some cinnamon peaches. Back to grapes. We took what we had and I made some grape jelly with it. I actually came up with my own recipe to suit our needs and it came out great. I used some of the apples as the pectin instead of buying that. They grew well. We probably could have waited another 2 weeks to butcher, but I didn’t want to feed them another bag. It wasn’t cost effective. But we pretty much knew it wouldn’t be this year. We saved 11 chickens – 2 roosters and 9 hens for a laying flock and to hatch eggs next year. We’ll be letting the chicks stay and eat with the laying flock, but taking them out when they get a little too big to distinguish between the laying hens and the new chickens. If the roosters or any hens are mean, we’ll lock them up in the old chicken tractor while the chicks are too small. I’m sure the plans will need adjusting because we’ve never done this before. If I had to order chicks again, I’d probably order ALL roosters. They weren't mean or loud at the age we butchered. The New Hampshire Red were suppose to be a fast maturing breed, but the roosters didn't crow yet and our Buckeye roosters were actually the only ones to crow before we butchered. The roosters were SO much bigger than the hens. The New Hampshire Red roosters were faster maturing in size at the beginning, but the buckeye roosters are huge while the females are relatively tiny. We couldn't have ordered all roosters this year, though, because we needed to have some hens and pick the best of the best to keep in our flock. It made it so easy to raise all 33 together so that the pecking order was already established and we weren’t adding roosters or hens from outside sources. So how does our current system work? We have two free range chickens that help us out with the manure spreading and eating fly larva so that the flies don’t go crazy. We are rotating the cows so they don’t kill all the grass by trampling and so that the manure is spread out. The laying hens and roosters are in the chicken coop with a run and will be our composting birds. They’ll get all the scraps from the house and anything around the yard. The garden’s are fenced off from the chickens so that a few can free range. And the hens will hopefully go broody sometimes so that they hatch us some eggs and give us chickens for the freezer every once in a while. Since the grass isn't the greatest this time of year, we've been haying the cows and giving them kelp meal and mineral salts as supplements. Winter will be another story, but I don’t want to go into that yet. What did we improve this year? A lot actually. We mulched the garden, which helped (and hindered, you’ll read about that next). We tried some gardening we hadn’t tried before. We planted rhubarb, and the asparagus should be ready for the first cutting next year. We raised new chickens and fixed up and moved the big chicken coop. We purchased cows and have a decent system going on. We have a fence. We learned a lot. The mulch. Well, it suppressed the weeds, but created weeds as well. We supposedly got seedless straw, but it had oat seeds in it after all. Those took over the garden because we hadn’t expected to have to weed so much. I mean, we knew we wouldn’t be able to weed so much so we put the mulch down – and the mulch failed. It totally defeated the purpose. Not sure what we’ll end up trying next year because the straw did improve the soil quality. There were a lot more death worms and activity under the straw than anywhere else - and it will be good to till in when the cows are done eating all the oats. Having fun in the garden today. They've pretty much eaten all the good stuff now. What do we need to improve next year? Gardening. We need to space things out better. We were cramming as much in as possible and making it difficult to work in it because we were limited by our fences. We knew we couldn’t afford to put up big fences so we could only use the fencing on the property that was left over form my Grandparents. So we made the fence a pretty good size, but it was a bit cramped. We needed the fence because of our free range chickens. They eat my garden. Next year, we’ll be using electric chicken fence to guard against predators and hopefully keep our chickens out again. We reused the fence from the garden for the chicken run. Maybe improve the way we feed the chickens. I'm going to see how growing fodder as a food supplement works out. I'm hoping to grow it in the greenhouse. We are building a greenhouse, so we will be starting more plants and keeping them away from Basil (who destroyed my broccoli and other starters this year). And if the fodder for the chickens doesn't work out, I'll try mixing my own, or soaking grain, or raising worms... I fully intended to start raising worms for the chickens protein this year and didn't get to it. Oh, and we need to get some bees. And raspberries, strawberries and blueberries. And maybe learn to grow mushrooms. Some recipes we'll want to hold onto? Tomato Sauce with amendment: put quartered tomatoes in pot and boil down. Don't remove skins until significantly reduced to make sure you get all the pulp, juice, and flavor out of the tomato. Crushed Tomatoes with amendment: leave the skins on because it's easier and we don't care about the texture. That is a lot of yummy food! Very impressive for sure. 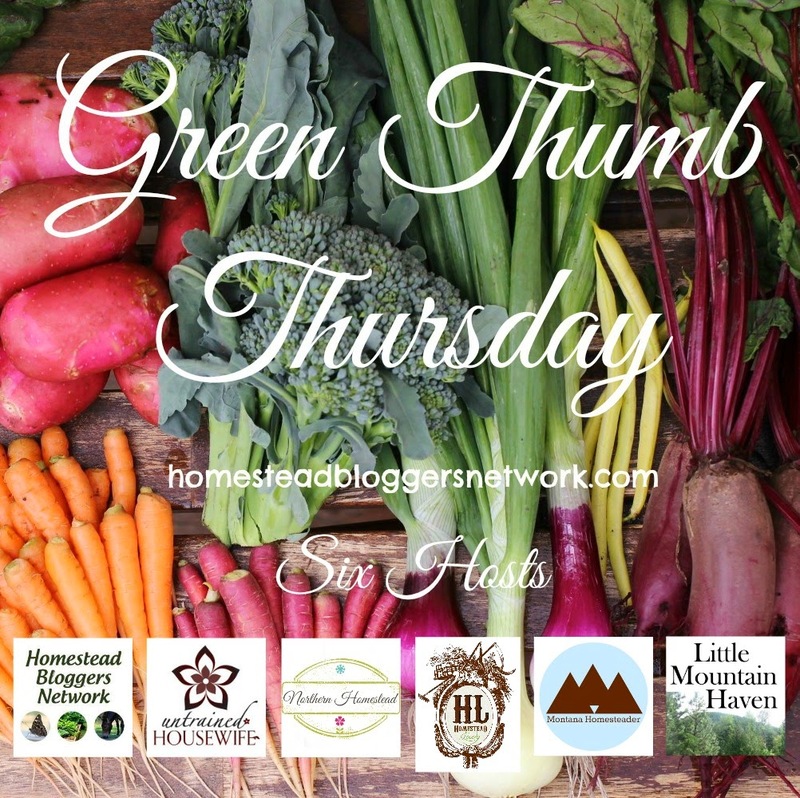 Thank you for linking up at Green Thumb Thursday. Come and link up this week again! Thank you! I'll be there! Progress and a cow on the loose. How far do we want to go with sustainability?